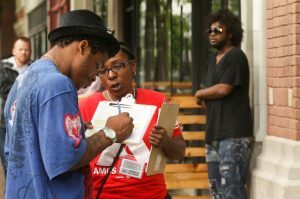 Do organizations raise more money by offering small gifts to potential donors? Researchers Catherine C. Eckel, David H. Herberich and Jonathan Meer investigate whether gifts to donors raise giving by more than they cost. Their findings indicate that gifting, at least on a relatively small scale, does not pay off. How do potential donors respond to receiving gifts from organizations that appeal to them for support? Previous experiments suggested that gifts are more appealing to donors if they can be used to indicate an affiliation with a prestigious or significant organization. With that in mind, the researchers partnered with an alumni association, the Association of Former Students, or AFS, at Texas A&M University and used luggage tags branded with the association’s logo as rewards. In a direct mail appeal, the researchers contacted 140,642 Texas A&M alumni who had not donated the prior year or had recently graduated. Seven different treatments were used in the mailings to measure responses to requests for donations. Some solicitations included what the study terms an “unconditional” gift and came with the request for a donation and required no response. Some unconditional gift recipients received a leather luggage tag and some a plastic one to enable researchers to evaluate the impact of a gift’s quality on potential donors. Other treatments offered a “conditional” gift of a plastic tag and would be sent if a donation was made. As a control, some mailings neither contained nor offered gifts. Noting that a significant number of subjects in previous studies had claimed they wished charities would save money on overhead by not offering gifts, the researchers offered opt-in and opt-out choices in some of the conditional mailings. In addition, some envelopes had the text “special offer” displayed on the front. 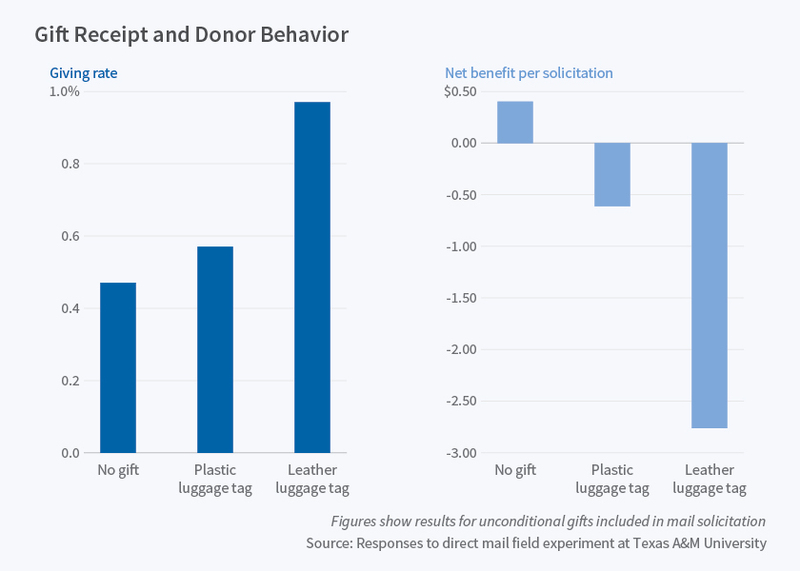 Most significantly, for organizations planning donor appeals, the researchers found that there was no difference in donation size between the control group and the group that was offered a luggage tag if they sent in a donation. Donations were higher when the luggage tag was included in the initial mailing as an unconditional gift. The quality of the gift also had an impact on donations; the leather unconditional gifts were associated with a higher likelihood of donations being made than the plastic unconditional gifts. Those results notwithstanding, the expense of shipping the item to all prospective donors exceeded the larger donations gained from the recipients of unconditional gifts. Solicitations including the unconditional leather gift produced a net loss of almost $3 per solicitation. Solicitations that included the unconditional gift of a plastic tag lost 70 cents. Solicitations that did not offer a gift registered a net gain of 26 cents.